A boiler is one of the most important household appliances that you can't afford to miss especially during the cold winter months. It provides hot water when you need it and most importantly supports your entire household central heating system. Just like any other appliance, a boiler should be serviced regularly by a professional to make sure that it continues to operate at an efficient level. It will not only keep energy bills low but also ensure that you will never lack hot water when you need it. While most homeowners like doing stuff on their own, experts advise that you should not attempt to service your own boiler especially if you are not a specialist in that industry. This is because boilers are complex appliances with numerous components that should be handled by professionals only. Keep in mind that some of these boiler components are electrically operated. Thus, messing up with them will mean short-circuiting that might have an adverse impact on your boiler. Instead of 'DIY' boiler repair, you should consider contacting Eco Efficient. This is among the top companies in the United Kingdom that provide boiler servicing at affordable rates. The company's profile is amazing as it features several decades of experience and an unmatched reputation among its clients. Besides, the company delivers top-quality services in time and surprisingly, we charge affordable prices for each service we offer. 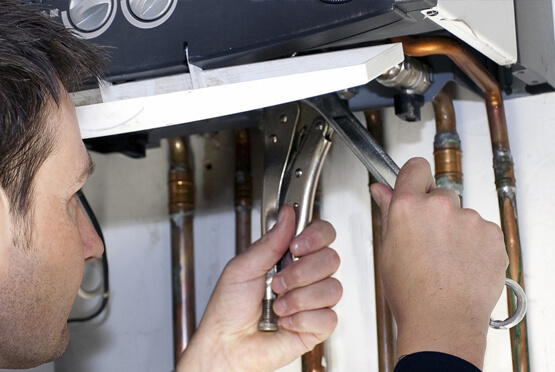 Our main mission is to provide Middlesbrough residents with excellent boiler servicing. This is geared towards making sure that each home has a functional boiler without the homeowner having to spend much money on such services. We have managed to achieve this objective because we have a team of engineers with an in-depth understanding of different boiler types and models. This places these engineers at a better position to service these boilers effectively. We have acquired the latest technology required for boiler servicing. For instance, you have the right tools and equipment required to detect boiler leaks even the minor ones. Besides, we have the required tools to repair boilers and ensure that your boiler is back to its optimal level. During the boiler servicing process, our engineers will inspect all the components of your boiler to make sure that each of these components is running effectively. Afterwards, the boiler will be cleaned and any fault corrected in time. This will minimize the expected breakdowns. Lastly, we have acquired the right human resources necessary for delivering excellent services. For instance, we have made sure that our engineers are highly trained regularly to keep abreast of the ever-changing domestic heating technology. With the introduction of the latest combi boilers and other types of boilers, any domestic heating expert should aim at acquiring the right skill set to service the new boilers. This is the main reason we always train our engineers regularly.